Xuan Zang, one of the most famous travelers of the ancient world, made an epic journey from his native China to South India and back, in the seventh century of our present era. His entire journey was made on land , unlike that of another famous Chinese traveler, Fa Xian, who also had traveled to India two centuries earlier by the land route, but had returned back to China by sea . Xuan Zang had left the then Chinese capital city of Xian sometime in 629 AD and could return back home only in 645 AD. I have always felt that the people of India, should especially thank this Chinese monk, because he has left behind an extensive travelogue of his entire travel. Just because of his travelogue, many events in the Indian history could be fixed reliably in a time line. One of the disciples of Xuan Zang and his fellow traveler, Shraman ( follower monk) Hui Li had also written an independent travelogue on his own, even though he preferred to call it ‘The life of Hiuen-Tsiang ‘ (as translated by Samuel Beal) . This travelogue augments the the travelogue written by Xuan Zang himself rather well and together, both these travelogues, reveal a store house of information about medieval India. Both these travelogues again have been a subject of great and extensive research for more than a century, from people across many countries. Many researchers also have drawn maps and charts to show the route taken by this monk. Even on modern day cartographic tools like Google Earth, one can find extensive work done by many people. However there is one segment of his travel, which has always remained a rather gray area, in spite of all this research. This concerns his travel from the southernmost point of his journey at Kanchipura (Jian-zhi-bu-luo , 建志補羅, काञ्चीपुरी) in South India, which Xuan Zang calls as Dravida (Da-luo-pi-tu, 達羅毘荼), to the city of Ba-lu-jie-tie-po (Bharukachha; Barygaza or Bharuch) , which is located in today’s Gujarat state in western India. XuanZang describes the land area or the country lying between these two places as Mo-he-la-tuo (摩訶剌佗), which has been identified by all the researchers now, as present day Maharashtra state in India. As a native and resident of this state of Maharashtra, I was always very curious about the journey done by this Chinese monk, approximately 1400 years ago, in my home state. Last summer, I read a book, ‘Chasing the monk’s shadow’ written by Mishi Saran. I was however disappointed, because the author had not been able to get much information about the Maharashtra segment travel of this monk. Recently, I came across number of old books and research papers on the Internet about Xuan Zang’ travels. These included the translations carried out by Thomas Watters and Beal and many research articles by Vincent Smith, E Burgess and J. Fleet. Surprisingly most of the research was done in late nineteenth century and not much effort was made by any one, after that. The history books about India, off course, have been having field day and have interpreted the travel route in Maharashtra as per their own sweet wish. Perhaps one of the major difficulty faced by these researchers from the Nineteenth century was the non availability of information about the region of Maharashtra and it’s history. The history of this region was always obscure, being in the shadow of the well known history of North India from the times of the campaigns of Alexander the Great (Around 300 BC), which also happens to be well documented. Today anyone who is interested, is in a better position to make an educated guess, because of the availability of a huge quantity of research material on the Internet. I therefore thought of making an attempt to try and solve this mystery of XuanZang’s trek across Maharashtra in India. However I must admit that I am acutely aware of my principal shortcoming; my total ignorance of the Chinese script. I have therefore no choice but to depend on the English translations done by historians like Beal and Watters from earlier Chinese books. Even then, I feel certain amount of confidence with services of Internet being available to me. For ease, I plan to address Chinese monk Xuan Zang as 'our monk'. Our monk turned back towards north from Kanchipuram. Before we describe his next destination, let us see, if we can possibly chart his route to Kanchipuram from Chandavaram. Both, Hui Li and our monk, mention that they travelled though a wild forest district to reach Kanchipuram. The shortest route that connects these towns, passes through present towns of “Markapur”, “Badvel”, Rajampet” and “Tirupati” before reaching Kanchipuam. By the present motorable road along these towns, the distance between “Chandavaram” and Kanchipuram works out to about 409 Kilometers (1308 Li), that matches well with the distance mentioned by our monk. The route passes through heavily forested hilly areas before reaching “Tirupati” town. This again matches well with what the monk has described. Describing next part of his journey, our monk says. “Leaving the country of Da-luo-pi-tu (Dravida) and travelling northwards, we enter a forest wild, in which are a succession of deserted towns, or rather little villages. Brigands, in concert together, wound and capture (or delay) travellers. After going 2000 li (625 Kilometers) or so we come to Gong-jian-na-bu-luo (恭建那補羅, Konkanapura)”. Hui Li gives the direction as northwest and adds that his master began this journey in company of seventy monks from Sri Lanka. The inferences that can be drawn from our monk’s narrative can be listed as under. a. The major part of the journey was made in hilly, heavily forested area. This can be agreed upon immediately as any journey made northwards or to northwest from Kanchipuram would have to be via modern towns of “Chitoor”, “Kadapa” and “Kurnool”. The major part of this route runs along the areas adjoining the western foothills of Eastern Ghat mountains, which probably were heavily forested in seventh century. b. There were many deserted villages along the way, which suggest that the region was ravaged by a retreating army in recent past. This observation probably relates to the running feud between Chalukya King Pulakesin second and Pallava kings Mahendravarman and his son Narasimhavarman of Kanchipuram. 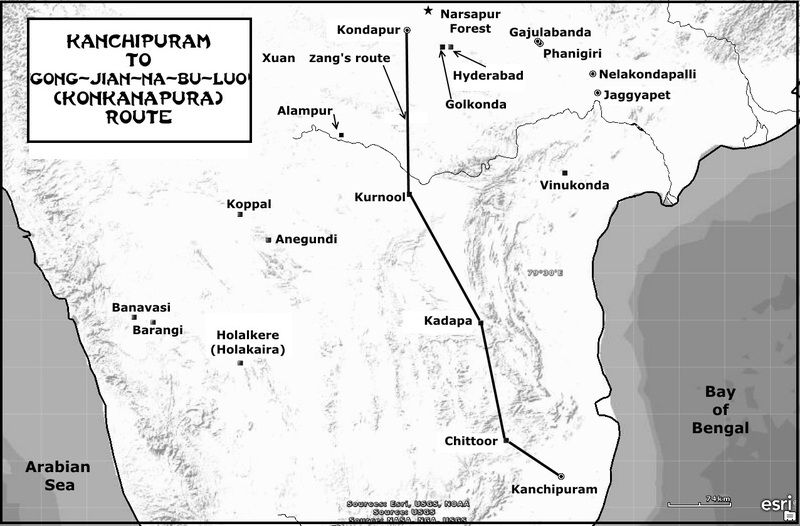 Around year 618-619 CE, Pulakesin second had attacked Mahendravarman’s armies, forcing them to retreat to Kachipuram. Pulikeshin had won a major victory in this war and his army had reached up to a point just 64 KIlometers short of the capital city of Kanchipuram. He was not able to proceed further and his victorious army had gone back to Badami, the traditional capital of the Chalukya kings, destroying everything on the way (as was the tradition in those days). This fact finds a mention in the ‘Aihole’ Epigraph. Because of the indecisive nature of this campaign, fourteen years later (634CE) Pulkesin second decided to measure his strength against Kanchipuram again, which was then ruled by Mahendravarman’s son Narasimhavarman. Several battles were fought by these two adversaries, the most important once being at “Pariyala”, “Suramara” and “Manimangala” where Pallavas led by Narasimhavarman appear to have had an upper hand. This was the political situation, when our monk travelled in this territory and his comment about finding many deserted villages along the way seems quite appropriate for the situation. Our monk describes the country of Konkanpura in these words. “This country is about 5000 Li (1562 Kilometers) in circuit. The capital is 30 Li (9.4 Kilometers) or so round. The land is rich and fertile; it is regularly cultivated, and produces large crops. The climate is hot; the disposition of the people ardent and quick. Their complexion is black, and their manners fierce and uncultivated. They love learning, and esteem virtue and talent”. About the religious scene he says that there are 100 Sangharamas with 10000 priests of both (Mahayana and Hinayana) schools. There are several hundred Hindu temples of various sectaries and Hindu religion is followed widely. Our monk also describes a forest of Tala trees, not far to the north of the city. Our monk describes these trees as, “The leaves (of this tree) are long and broad, their colour shining and glistening. In all the countries of India these leaves are everywhere used for writing on”. In this forest there is a stupa. He also mentions four Buddhist landmarks in the surrounding areas. f. A hundred feet high stupa built by Ashoka-raja not far to the south-west of the city. By the side of it is a ruined Sangharama. Before we proceed any further and attempt to make a guess regarding identification of Gong-jian-na-bu-luo (Konkanapura), let us first find out the names of places suggested by historians as possible candidates for Kokanpur’s location. St. Martin suggests “Banavasi” in “Shimoga” district of Karnataka located about 537 Kilometers from Kanchipuram. Cunningham suggests “Anegundi” village on banks of Tungbhadra River in Karnataka state (448 Kilometers from Kanchipuram). Fergusson suggests “Holalkere” town in Karnataka (500 Kilometers from Kanchipuram), whereas Burgess considers it as “Koppal” in Karnataka (639 Kilometers from Kanchipuram). Finally we have Beal, who suggests the name of “Golkonda” in Telangana state (513 Kilometers from Kanchipuram). The principle reason for selection of these places by these Nineteenth century historians, appears to be the distance between these places and Kanchipuram)and the fact that these are located to west- Northwest of Kanchipuram. However all of these, except for Golkonda, are much towards west. It become obvious therefore that when we take into consideration the fact that that our monk’s aim was to reach north as earliest as possible, all the places except Golkonda get automatically rejected for this reason. This leaves only Golgonda with us as the right candidate, which has the right distance from Kanchipuram as well as right general direction. An ancient trade route joined the city of Pratisthana in south, to cities such as Kanyakubja in north. 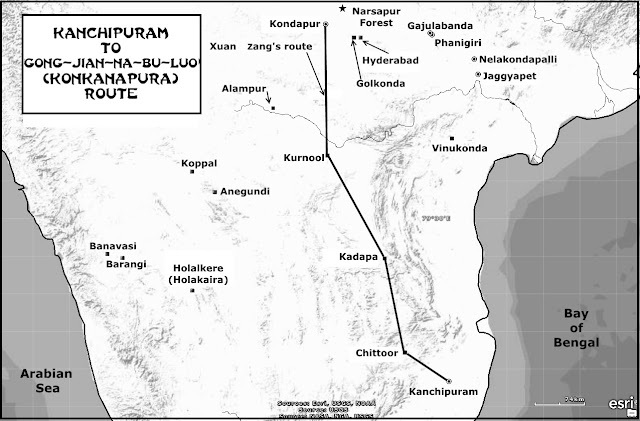 This ancient trade route from south (known as Dakshinapath) is mentioned in one of the early Buddhist scripture, written in Pali language, Sutta Nipata. This book says that this route starting from Pratisthana city (presently known as Paithan in Maharshtra state) reached Kaushambi through “Mahismati”, “Ujjaini”, “Gonaddha”, “Vedisa” and “Tumbavana”. From Kaushambi, the travellers could proceed to Sravasti via Saket. We can therefore safely assume that for our monk, his first goal, after starting from Kanchipuram, probably was the Pratisthana city, where he could join the Dakshinapath mentioned in Sutta Nipata. In 1901, J.F Fleet tried to trace this ancient route starting from the eastern seacoast and the country of Tamil people (Dravida) to Bharauch on west coast of India. He says. “A study of maps has shown to me the former existence of an early trading route, of which well-marked traces still remain, from the east coast through Golkonda, Ter and Paithan to Bharauch”. According to him, the first starting point of the trade routes was at Masulipatam (Machilipatnam) and the second at Vinukonda (Chapter47). They joined somewhere near Hyderabad city. (He mentions either 26 miles east-by south of Hyderabad or 23 miles further in that direction). From this point, a single route began that passed through Golkonda-Kalyani-Ter-Paithan-Daulatabad-Chandwad (Chandore) to reach Markandeya (Merkinda pass-west of Nashik district). Here the main difficulties began through the Western Ghats, over last 160 Kilometers to Bharauch. 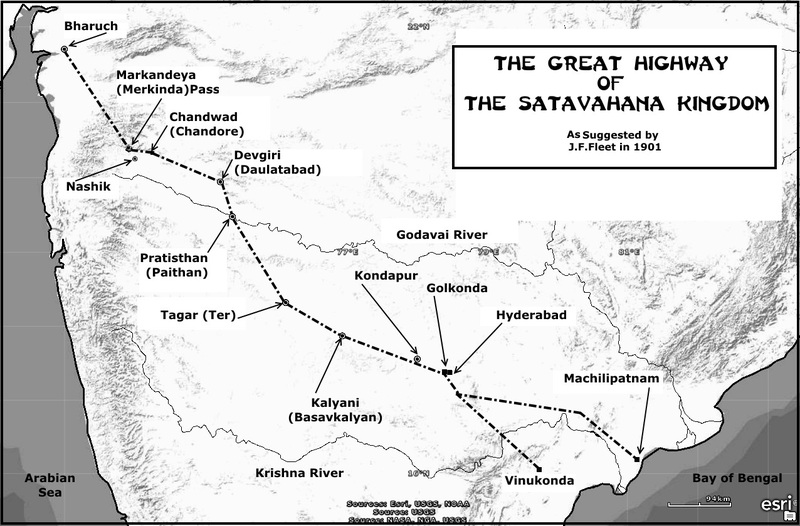 This was the great highway of the Satavahana kingdom. From above discussion, it is easy to conclude for us that our monk’s Gong-jian-na-bu-luo (Konkanapura) was certainly located somewhere nearby Golkonda village, a place from where, he could join the ancient trade route from east that connected to Pratisthan city. It so happens however, that Golkonda village is situated on a plateau, amongst a terrain that could be labled as a hostile and not very fertile. Possibly, because of this reason, archaeologsts were not able to discover any sites in this region with a Buddhist affiliation, unlike clusters of sites to north (Kotilingala, and Dhulikatta- Chapter 46) and to northeast (at Gajulabanda, Phanigiri, Nelakondapalli and Jaggayyapeta- Chapter 47). All this changed in year 1940-41, when Gulam Yazdani, a senior archaeologist working with State of Hyderabad discovered a large ancient town with antiquity traced to first few centuries of our era. The site was situated at a distance of 43 miles (69 Kilometers) to south-southwest of Hyderabad city. It was located on a small hillock that rose to the height of about 10 meters above surrounding areas and about a Kilometer to south of a village known as Kondapur. Yazdani started excavations on western end of the mound, which was higher than the eastern part by about 10 to 12 feet ( 3.65 meters). He describes his finds in these words. “ Remains of the building, which began to come into sight after we had removed 20 to 30 inches (76 Cm) of earth from cultivated surface. Therse remains show traces of old walls, houses built of brick as well as rubble, shops with furnaces and large earthen basins, religious structures comprising Stupas, Chaityas and viharas or monasteries. Besides we found a large number of movable antiquities such as pottery, terracotta figurines, beads and ornaments”. The site was inspected next in 2008 by D. Jithendra Das, superintending archaeologist with the Archaeological survey of India. He is reported to have confirmed the Buddhist nature of the site besides saying that the ancient Kondapur City was larger than Amaravati and was skirted by a mud-fort, the walls of which which were still visible. Archaeological Survey of India again took up the excavation work in the years 2009-10 and 2010-11, on a sprawling area of 81 acres (32.8 hectare) and have now come to conclusion that actually the site is an important milestone from a period that began two centuries before, and ended three centuries later, from beginning of our era. The new series of excavations were headed by G. Maheswari, Superintending Archaeologist, Archaeological Survey of India. The main discovery at the excavation site included some brick structures found in the western extreme of the main mound, which yielded authentic evidence of a Vedic or fire worshipping sect. It's a vast complex having a circular shrine facing south with one entrance and surrounded by rectangular chambers and fire altars , three metres in depth, having 37 courses of burnt bricks of different shapes -- triangular and sand clock-shaped, behind the chambers. These supposedly fire altars have yielded significant evidence of fire activities in them along with five numbers of pots stamped with impressions of a trident. Apart from this, the whole temple complex yielded plenty of animal bone pieces, perhaps for sacrificial purposes and related pottery articles such as bowls, sprinklers, spouted vessels and iron implements like spear heads and knives. The kings obviously performed the ‘yagnas’ at these altars and sacrificed animals to propitiate the goddess or seek a male heir. A lime and clay image of a Brahmin, probably the Raja Guru, with a thick sacred thread, embracing the king, along with many silver and gold-plated coins and terracotta seals bearing images closely resembling Roman Emperor Tiberius have also been found. This image shows clearly the status enjoyed by Brahmin priests. Even though, the two archaeologists have diammetrically opposite views about the religious character of the Kondapur site, it is an undoubtable fact that Kondapur was once a thriving city, at least upto third century of our era. What we do not know for sure is whether the city still existed in the seventh century? We can perhaps find the answer to this question in the following comment by H. Sarkar. “ It is often argued that it is because of Kondapur’s location in the centre, connecting the Buddhist centres on the east coast with those on the west that it grew as an important junction in an otherwise hostile and not very fertile terrain chracteristic of the Deccan plateau”. This situation was more or less the same in the seventh century as it was in the third century, with Buddhist monks travelling across the plateau to visit innumerable monasteries scattered all over the Deccan region. We therefore feel that it may not be erroneous to assume that Kondapur, situated on the east-west trade route described by Fleet (see above), probably existed, even in seventh century and we can certainly identify it with our monk’s Gong-jian-na-bu-luo. With identification of Gong-jian-na-bu-luo completed, let us try to see if we can identify the Buddhist and other landmarks mentioned by the monk. About 35 Kilometers to northeast of Kondapur, there is a reserved forest, known today as Narsapur forest, which perhaps can be identified with our monk’s forest of Tala (ताल, Borassus Flabellifer Linn, Palmyra palm) trees. Jean de Thévenot (1633-1667) was a French traveller to the East, who wrote extensively about his journeys. He travelled to Golkonda from “Devgiri” or “Daulatabad” in 1666-67, in perhaps was his last journey. (He died just months after in Iran, on his way back.) Interestingly, he writes about a forest located to north of Golkonda in these words. “(We) passed over the pleasantest Hills in the world, by reason of the different kinds of trees that cover them. On this side of a rivulet (Golkonda side) there are wide Palm-trees”. It is almost unbelievable that even after a gap of nine centuries, the Tal trees forest described by our monk, still was in existence. Regarding the stupa and ruined Sangharama (item f) to southwest of the city, he could be referring to “Alampur” ruins. The Stupa in the east that has sunk in ground (item e), could be either from “Phanigiri” or “Gajulabanda” Buddhist sites. Our monk moved on. Hui Li describing his master’s journey says. “From this going north-west, we enter a great forest wild, where savage beasts and bands of robbers inflict injury on travellers. Going thus 2400 or 2500 Li (781 Kilometers), we come to the country of Mo-he-la-tuo (摩訶剌佗, Maharashtra).